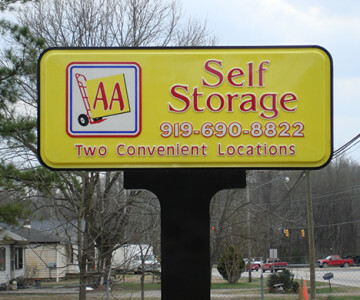 Whether you’re a homeowner or business owner, renting a portable storage unit in Oxford, NC is simple with AA Self Storage. Our portable storage unit rentals are available in a variety of sizes to meet any and all of your self storage needs in the Triangle, and each one comes equipped with translucent roofing for easy loading and secure door-locking systems to ensure maximum theft protection. In addition, our Oxford portable storage solutions feature steel and aluminum weatherproof designs, a load-bearing capacity of 6,000+ pounds, and DuraPlate truck body construction to provide an unmatched level of protection. Why Choose AA Self Storage for Portable Storage Rentals? For more information about our Oxford, NC self storage and portable storage solutions, please visit our facility located between Falls Lake and Kerr Lake or make an online reservation for a portable storage unit. Contact us today! We look forward to assisting you with all your moving and storage needs.